Pattie Ann Hale is a leader in the contemporary exploration of arts and faith. 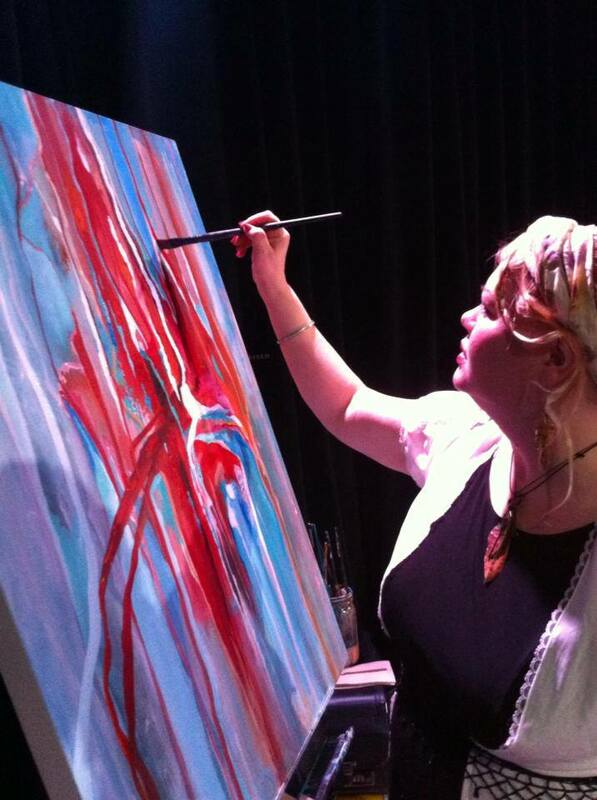 Besides her daily work as a professional visual artist, she also regularly speaks and teaches at events and artist gatherings and paints live during worship events. The continual sharing of her creative life and wisdom gained by that experience through online platforms such as her Journeyartfully writings, video blog, artistic life-coaching programs, and online classes has given her opportunity to speak into the lives of many experienced and up-and-coming artists interested in exploring their faith through the avenue of the arts. She leads seminars and hands-on workshops concerning the spiritual in the arts throughout the country and abroad. In her workshops, which often focus on wholeness and healing, she guides participants in experiencing a spiritual visual language. Pattie Ann Hale is the author of Journeyartfully: Secrets for Living an Artful Life and is writing her upcoming book: Sacred Revolution – The Power of God in the Arts. She is the former Associate Director of The Worship Studio and the former director of the MorningStar Art Gallery of MorningStar Ministries and Publications (Charlotte, NC) where she was on staff as a layout artist and was an integral part of the MorningStar Worship Art Team from 2007 – 2009. Pattie Ann is also the former director of The Appalachian Arts Center, which is a retail gallery and educational and community art center that focuses on local artists and the arts of the Appalachian Mountains. Pattie Ann Hale, a native of the Appalachian Mountains of Southwest Virginia, is a visual artist, writer, and teacher who focuses on the connection to the sacred through art. Her spiritual expression is primarily carried out through oils and acrylics on canvas. As she creates intuitively through a process of movement, prayer and play, her art mysteriously unfolds from a place of journeying in the spirit and the visual story comes into surprising existence. The resulting paintings are expressive offerings of metaphorical images, abstraction, and a reflection of movement. Her layers of color and perspective create depth and dimension which invites one to see beyond the natural and into the place of the spirit. Her art is inspirational, contemplative and provoking. Pattie’s work is collected throughout the nation and abroad by private and corporate collectors. Her work is represented in the Art and Faith Catalog by White Stone Gallery of Philadelphia, PA, The Barr Gallery in Abindon, VA, Red Poppy Studios and Gallery in Layfayette, IN, and at Cairn University via White Stone Gallery, Philadelphia, PA. Private collectors include Nascar celebrities, Jeff Burton and wife Kim, and Ward Burton and wife Tabitha. In her formative years, Pattie Ann Hale studied intensively with and was mentored by artist Ellen Elmes, from the New York area, who was a Parson’s School of Design student, and who was an arts and cultural advocate to the Appalachian Mtns. Ellen’s philosophy of, “Art is a language that allows us to share and communicate the essence of being human.” greatly influenced Pattie Ann’s art and process of study. Throughout her career, since her college art studies with Elmes and other inspiring teachers, Pattie Ann has been on a studious journey of art history, creative marketing seminars and workshops, many spiritual worship conferences and schools, technique workshops by various facilitators, intense experimentation, art gatherings to study and share technique and philosophy, and traveling to see some of the finest art in New York City and Washington DC, as well as taking every opportunity to see and study fine art in smaller cities such as Atlanta, GA, Charlotte, NC and her own amazing culturally rich artistic area of Asheville, NC.